Max Factor, who founded the company of the same name, and produced various powders and creams for the movie industry passed away in 1938. His son, Frank Factor, then took the name Max Factor to smooth over the transition of the company. 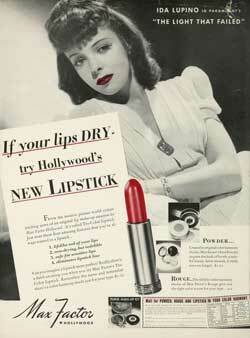 It was Max Factor Jr. who introduced a revolutionary new lipstick in 1939. The lipstick known as Tru-Color was the first non-drying, indelible lipstick which did not change colors. This non-irritating, smear proof lipstick was marketed as “the world’s first perfect lipstick” and changed the world’s perception of lipstick. No patent was issued for this lipstick. Over the years, the Max Factor company has received patents for lipstick containers and designs. The company was even granted a patent for a method to remove lipstick. The earliest lipstick related patent was US Patent 2,192,675 granted on March 5, 1940 for an Apparatus and Method of Manufacturing Lipsticks.